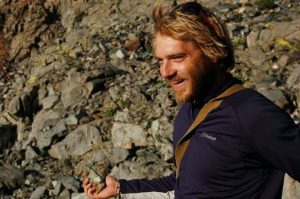 Research: With well-developed quantitative expertise, strong theoretical foundations, and diverse experience in marine, terrestrial, and island ecosystems, Jerry is a spatial and behavioral ecologist that studies animal movement, foraging, and habitat use. Using a biologging telemetry approach, he is most keen to understand how movement and behavior are affected by environmental processes as well as interspecific interactions, particularly between predators and prey. Jerry’s dissertation research focuses on recent recoveries of gray seals on Cape Cod, testing new models to understand regional abundance trends, intra-annual habitat use trends, and the role of shark predation risk in structuring foraging behavior. In all veins of his research, Jerry seeks to apply and test ecological theory in compelling manners that furthers theoretical development as well as achieves conservation outcomes . Prior to Duke: Jerry researched a broad range of topics with collaborators at Princeton University, Environmental Defense Fund, and Scripps Institute of Oceanography. He has extensive diving experience (300+ dives) developed while monitoring the rocky reef fish communities in the Gulf of California annually. Here with a regional focus and properly set baselines, our community ecology perspective elucidates the degradation of rocky reef assemblages and highlights management pathways towards near-pristine, high biomass states. At EDF, his research focused on fisheries management reform, data-poor methods for fishery stock assessment, and the translation of resilience theory for marine ocean management. At Princeton, his undergraduate thesis uncovered various search strategies in the movement of Neotropical antbirds in search of profitable (in terms of forage) army ant swarms. This thesis was awarded the department’s top prize, the Charles M. Canon Thesis Award. Additional independent work applied innovative conservation strategies like systematic conservation planning and conservation banking to various endangered species contexts.